I’m a wine nerd, but I’m not a wine snob. As proof: 1) I’m digging the recent wine-in-a-can movement, 2) I strongly believe in the existence of great wine under $15, and 3) I’m way on board with frosé (frozen rosé) and white wine slushies. 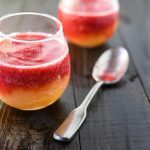 These delicious raspberry peach white wine slushies are a clever way to sneak in some fruit with your alcohol, making your fruit intake more fun and your alcohol consumption a little bit healthier. A win-win in my book. I got a little bit too excited while making these and ended up shooting raspberry slushie on the floor, the ceiling, in the light fixtures, and in dark corners that I’m sure Shae (who is more of an…aggressive…cleaner than I am) will be finding for months to come. So be warned: these babies have velocity, so either pay attention while you’re pouring or keep a dog (who, legally, should be at least 3 years old in human years) to help clean it up. how do you make a wine slushie? This one is easy. Add frozen fruit to a blender with your favorite wine and blend together until smooth. I used my Vitamix, which I absolutely love and use on a daily basis, to make sure these wine slushies were completely smooth. 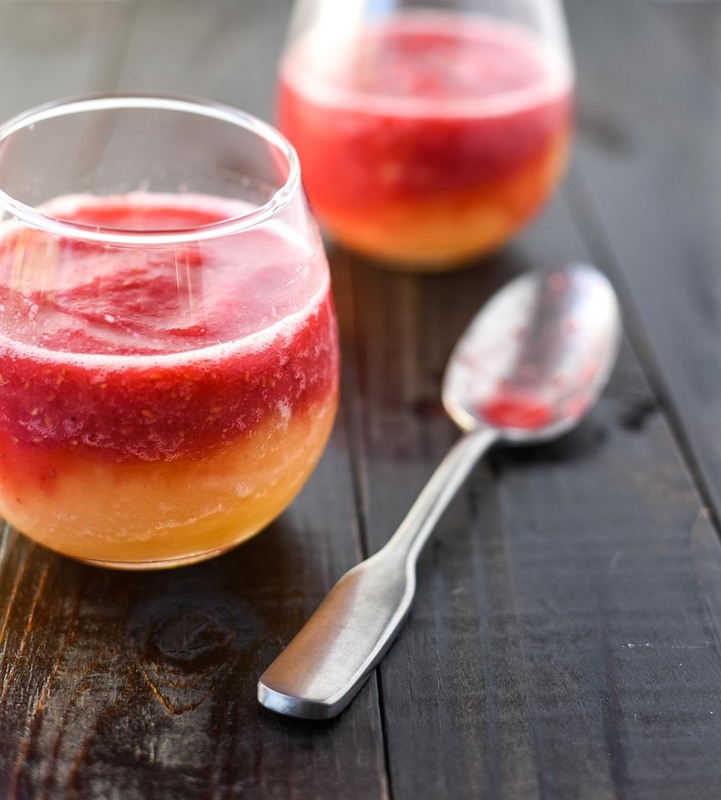 If you’re going for a fancy layered look like this raspberry peach white wine slushie, complete one level of fruit and wine, pour into glasses and stick in the freezer while you repeat with the second layer. Pour the second (or third!) layer on top and you’re finished! what type of wine works best for wine slushies? Use cheap white wine for these slushies–no reason to use a good bottle for these wine treats. I would recommend something sweeter like a Moscato or Riesling, especially if you’re sticking with the peach and raspberry combination, which can be tart. On the fruit front, you can easily mix it up — bananas, mango, or pineapple would be divine. Blend 2/3 bottle of white wine with frozen peach slices and 1-2 cups of ice cubes (start with one cup and if too thin, add another cup) in a Vitamix or blender. Pour into four glasses. Put in freezer while preparing raspberry layer. Blend remaining wine with frozen raspberries and 1 cup of ice cubes (if you want thicker, add additional ice). 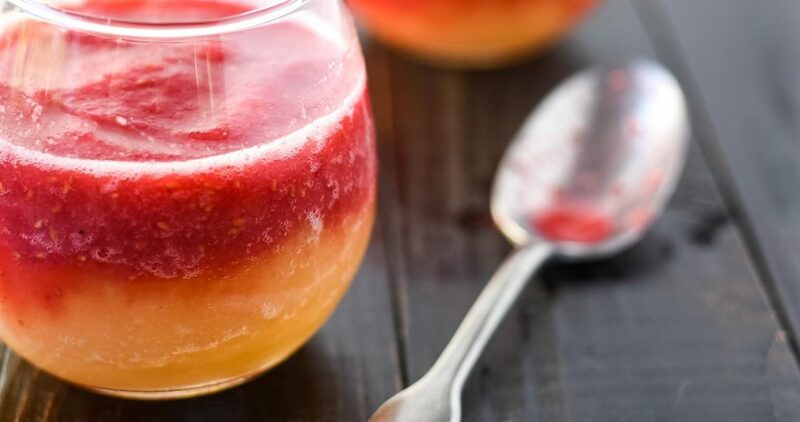 Remove glasses from freezer and pour raspberry layer on top of peach layer. Serve with straw, spoon, or just drink it! **You can substitute all kinds of frozen fruit – strawberries, bananas, mangos, pineapple, etc.